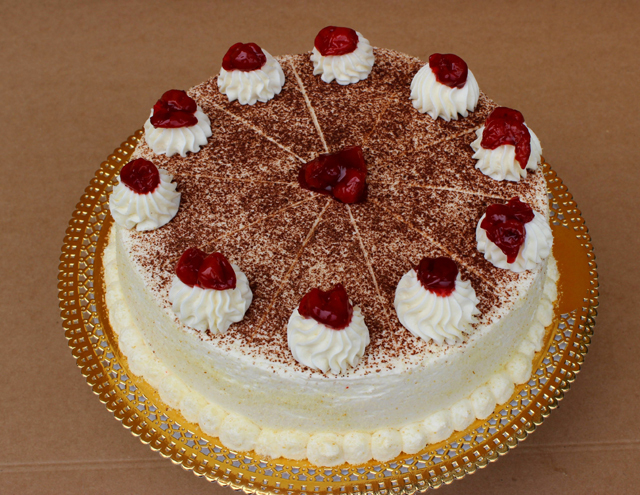 Tres Leches is a buttery sponge cake soaked in three kinds of milk and topped with whipped cream. Lightly grease two 9-inch springform cake pans and place a piece of parchment paper, cut to size in the bottom of each pan. Grease the parchment paper and lightly dust the pans. Set aside. In a large bowl, beat together the butter and sugar until very fluffy and pale, about 5 minutes. Add the eggs, one at a time, beating well after each addition and scraping down the sides of the bowl. In a small bowl, sift together the cake flour, baking powder, and salt. Add the dry ingredients to the wet ingredients in four additions, beating to combine well and scraping down the sides of the bowl. Spoon the batter into the cake pans, dividing evenly, and smooth the tops. Lightly tap the cake pans on the counter to remove any air bubbles in the batter. Bake the cakes in the oven until they are golden brown, about 20 to 25 minutes. In a medium bowl whisk together the condensed milk, evaporated milk, cream, and cinnamon until well blended. Divide the glaze evenly between the two cakes, pouring it over slowly to cover the entire surface of both cakes. Cover the pans with plastic wrap and chill the cakes overnight. Place the coconut in a large skillet over medium heat and toast it, swirling the pan, until the coconut is golden brown and very fragrant. Place the coconut in a bowl and set aside to cool completely. Pour the 35% cream in a large bowl and beat the cream until soft peaks form. Add the sugar and vanilla and beat until the topping is very think and fluffy. Take the cakes out of the fridge and run a knife around the outside edge of each. Release the springform edges and transfer one of the cakes to a plate by flipping it over so the parchment bottom is on the top. Spread the whipped cream topping over the top of the cake. Take the other cake and position it on top of the first cake. Carefully remove the bottom of the springform pan and the parchment. Frost the entire outside of the cake with whipped topping and generously sprinkle the top with toasted coconut. Decorate and store in the fridge. You can also top this cake with chocolate curls.